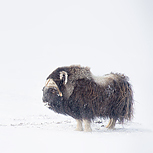 Amongst the many iconic wildlife found in the Nordic countries, nothing is more majestic than the mighty Musk Ox. They live in some of the most inhospitable parts of Norwegian tundra, high up in the mountains, during the harsh winter months. This is precisely where we will be photographing these magnificent mammals. This is a trip unlike any of the conventional wildlife photography tours out there. We will not only record their precarious existence against spectacular winter backdrops, but we will also have the privilege of living alongside them for the duration. Camping under the northern sky, we may even catch a glimpse of the dancing Aurora Borealis, on a clear evening. Working in these wintery conditions for a few continuous days is not easy and it can be very cold. But this will add to the great sense of achievement when you return with images that you have really worked hard to attain. Day 1: You will be picked up from Trondheim Airport. Before booking your international flights, please talk to us so that we can help coordinate everyone’s landing time to minimize waiting. After checking in at our hotel, we will have a briefing about the adventure ahead of us. Assuming the forecast is fine, we will confirm and go over our program to camp on the mountain. Day 2: We will be driving to a suitable spot for our point of ascent, where the mushers will be waiting as eagerly as the huskies to take us up the mountain. After loading all our equipment onto the dogsleds we will set off to our campsite. This is an exhilarating experience in itself if you have never been on one before. When we arrive, we will work together to set up the tents. After lunch, we will head out to look for the Musk Oxen. Our experienced guide will have worked out where they are likely to be, days before our arrival to maximize our chances of success. We may come across other wildlife, such as Ptarmigan and Reindeer, which also inhabits this area. Dinner will be prepared for you and there will be hot drinks to help warm you up before bedding down for the night. Days 3 – 4: The start time of this morning will largely depend on whether there is going to be a good sunrise. If the weather is cloudy then it is probably not worth getting up before dawn. We will stay out most of the day until last late afternoon/early evening, maximizing on the available winter light. Day 5: After breakfast, we will head out once more to photograph these incredible bovine for one last time, before heading back to camp for our lunch. Afterwards we will pack up all our belongings and head back down on foot. We will then be driven back to our comfortable hotel for the evening and reminisce about our little adventure over a scrumptious dinner. Day 6: Depending on the time of our flights, we will check out after a relaxing breakfast, and drive towards the airport for our journey home. Accommodation, all local transport, camping equipment, dogsled ride and all meals. The hotel on the first and the last evening is of a typical Scandinavian standard and will be clean, warm and comfortable. Single supplement is available for these two nights on request. While camping atop the mountain, for logistical reasons and warmth, we will be tent sharing. You will be provided with a camping mattress as well as a sleeping bag of your own. We may trek for up to several kilometers per day but with regular stops as required. The terrain is undulating with potentially deep snow. Snowshoes and walking poles are provided but you will be expected to carry your own camera equipment plus the food and drink during each outing. We will also be spending extended periods with little to no cover, so a good level of fitness is required.